So here's one of the better gaming related promotions I've come across in a while. 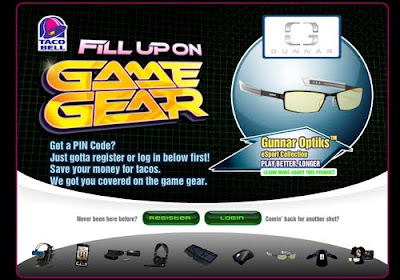 As you can see on our website, we are currently advertising Taco Bell Canada's Fill Up On Game Gear campaign in Canada. The promotion consists of a contest and tour that is making stops across various Canadian cities. 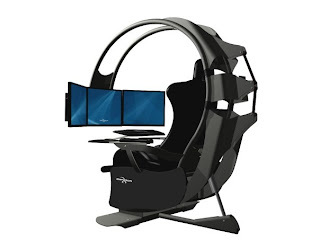 It is a brand new gaming station that brings new meaning to the term "game set up". The Emperor 1510 is developed by Canadian based company NovelQuest out of Quebec City. The Fill Up On Game Gear tour has already kicked off in the GTA with stops in Richmond Hill and Scarborough. Next stops include Whitby on October 1st and both Brampton and Vaughan on October 2nd. There are also events being held in other Canadian cities including Winnipeg, Calgary, Edmonton, Kelowna, Surrey and Coquitlam. At these events, you'll have the opportunity to try out some of the game gear prizes listed above - including the Emperor 1510 - as well as win other prizes. For more details on the Taco Bell Fill Up On Gaming Gear promtion, visit the Taco Bell Canada website at www.tacobell.ca. Fill up on Game Gear - so I should be using an old school sega portable system? Game Gear is one of the only handhelds I've never owned. Wonder if it was any good? Haha, it couldn't be that bad. What's the point? can any one tell me what the every store wins a prize pack is?